St. Vincent is one of those rare movies that seems to ooze formula, tropes, and predictability, but is still, in its own way, worthwhile. Much of this is due to an unsurprisingly great performance from Bill Murray in the lead role, as Vincent, a drunken, loud-mouthed, and hedonistic retired veteran living in a small Brooklyn house with his cat, Felix. He has developed a general distaste for humans, with the few exceptions in the world limited to fellow patrons of a local bar, and a Russian prostitute named Daka (Naomi Watts). Vincent spends his days and money betting at the racetrack, which is likely one of the reasons why his bank account at the start of the film is $112 overdrawn. That day, he goes home, hammers his thumb whilst crushing ice, then slips, hits his head on his kitchen cabinet, and passes out on the floor. The next day, after a particularly unpleasant prelude involving a tree branch falling on his car, Vincent finds out somebody’s moving into the house next door – specifically, newly divorced single mom Maggie (Melissa McCarthy), a CAT-Scan technician at the local hospital, and her 12 year old son Oliver (Jaedan Lieberher). Oliver, small and thin, is a frequent target for bullying at the Catholic private school where he has been enrolled. Being new to the neighborhood, there are no relatives close by to watch Oliver after school while Maggie is at work. She reluctantly allows her uncomely neighbor to do so, at the negotiated rate of $11 an hour, and as a result, Vincent and Oliver form, as many movie characters do, an Unlikely Friendship. Your level of appreciation for St. Vincent will be largely dependent on what your stance for its kind of tactic is. 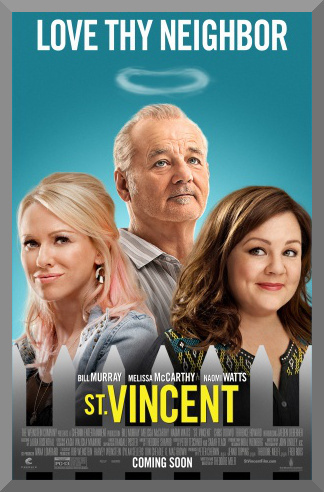 Starting as a more traditional mismatched neighbors kind of comedy, and then reverting into an unlikely friendship comedy, and then ending as a sentiment-heavy dramedy, all of these tonal shifts come with the added baggage that they’ve all been done to death, and St. Vincent is hardly a new spin on any of them. For some of you, that’s your cue to skip this one. But for the rest of you, read on: There’s still a certain degree of entertainment and charm at hand here, despite entirely familiar kinds of territory and approaches. Once again, elevated astronomically thanks to Bill Murray, able to craft a character at once deeply unsympathetic yet very much watchable. When more and more layers to Vincent are peeled back throughout the movie’s 103 minutes, and especially as a previously unmentioned aspect of Vincent’s life is introduced, there is a well written and multifaceted character here, or at least the potential for a better realized one. Writer/director Theodore Melfi, making his first feature film, has crafted a mostly confident debut, but it would be a lie to deny the struggles encountered in the story department, where there’s also a problem of some unanswered questions by the end. I liked the rest of the cast. Melissa McCarthy looks into some more dramatic fare than usual with many of her scenes here, and handles them with good levels of efficiency. Jaedan Lieberher provides a noteworthy acting debut as Oliver, never using the kid actor trick of falling back on an artificial air of precociousness as a substitute for a lack of acting skills – no, Lieberher is a good match for his more seasoned costars. Naomi Watts, despite putting on a Russian accent with debatable levels of accuracy, provides sufficient amounts of support in her role. And Chris O’Dowd, as Oliver’s teacher, is needed to introduce a number of events that are largely responsible for building up to a finale, which is pleasant and effective enough, but also very, very predictable. All I’ll say is that there’s a reason that the word “saint” is in the title. I believe, to a degree, there’s some sort of fault that becomes apparent in anyone who is egotistical enough to write at length about what they thought of a piece of art. With a lot of critics, especially movie critics, one of the most common ones that seems to crop up (or the one noticed the most by trolls spewing illiterate venom in the comments section) is a cold-heartedness, and how many of them turn off upon the immediate scent of syrup. I think I have the opposite problem – I might have too high a tolerance for schmaltz. And it’s clear when St. Vincent moves past the halfway point, that we’re moving away from its previously established comedic pace and going in a certain direction where more heavy material mixes in. But I enjoyed this movie with its warmth and wit, despite the shortcomings mentioned above, a feeling that many threads were left untied, and a feeling we’ve been to many of these places before. My two-and-a-half star rating is nearly precautionary, to remind myself to stay grounded with my thoughts, and that not everyone will be as accepting of its tricks. But hey, the older ladies sitting behind me in the theater this afternoon were audibly sniffling, so what do I know?